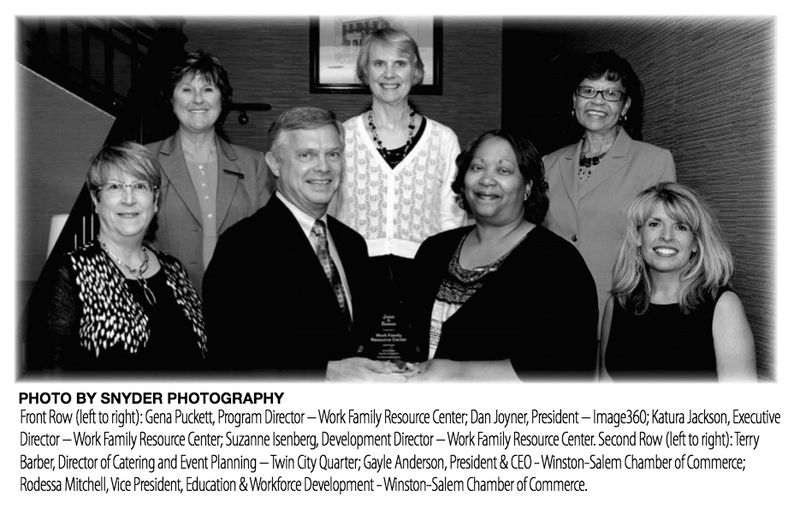 The Twin City Quarter and the Greater Winston-Salem Chamber of Commerce recently presented their Salute to Business Award to Child Care Resource Center. Gena Puckett, Katura Jackson and Suzanne Isenberg accepted the award recently at a special presentation luncheon at Twin City Quarter. The Salute to Business honors an outstanding contributor to the business community each month. It is administered by the Greater Winston-Salem Chamber of Commerce, the Twin City Quarter, Image 360, and the Winston-Salem Journal. Child Care Resource Center (CCRC) is a private, non-profit child care resource and referral agency created in 1991 as a joint effort between the Junior League of Winston-Salem, Northwest Child Development Council, The Winston-Salem Foundation, the United Way of Forsyth County and several local corporations. The work of the agency focuses on coordinating child care services with child care needs and promoting public awareness about the importance of quality child care.The mission of the agency is to provide consumer education, referrals and resources to improve the quality of child care in our community. CCRC helps parents find quality child care; helps income eligible parents access financial assistance to pay for the cost of child care; provides enhanced services to businesses and individuals; provides technical assistance and support to improve the quality of child care programs; maintains a database of over 400 legally operating child care centers; and collects and distributes information on the supply of and demand for child care. CCRC is supported by a strong Board firmly established in the business community that supports the agency’s efforts to improve the quality of the child care system in Forsyth and 8 other surrounding counties.